Until now, Western Australia’s Pilbara miners have fixed their attention on iron ore. Yet this focus is rapidly shifting, with a number of encouraging gold discoveries rousing explorers to vie for a chance to strike it rich. And it’s not just mining companies trying to get in on the action. Armed with metal detectors, locals are setting off from Karratha to find nuggets — it’s reminiscent of Victoria’s 19th century gold rush. This new rush on the Pilbara’s prospective gold land ramped up earlier this year, with a discovery of conglomerate-hosted Witwatersrand style mineralisation by Canada’s C$1.07 billion (A$1.09B) Novo Resources Ltd (TSX-V:NVO) and its Pilbara gold joint venture (JV) partner, Artemis Resources (ASX:ARV) . Many more ASX companies have since directed their attention to Pilbara gold, including Kairos Minerals (ASX:KAI), De Grey Mining (AX:DEG), DGO Gold (ASX:DGO) and Kalamazoo Resources (ASX:KZR)...to name a few. Today’s company in focus, Elysium Resources Limited (ASX:EYM), has thrown its hat in the ring too. EYM has just entered into a binding agreement to acquire Hardey Resources’ prospective gold and base metals projects in WA’s Pilbara and Paterson regions. The projects are each prospective for conglomerate-hosted gold and high grade orogenic gold. EYM will commence an exploration program almost immediately, targeting the conglomerate-hosted gold potential of Hardey’s portfolio of projects. 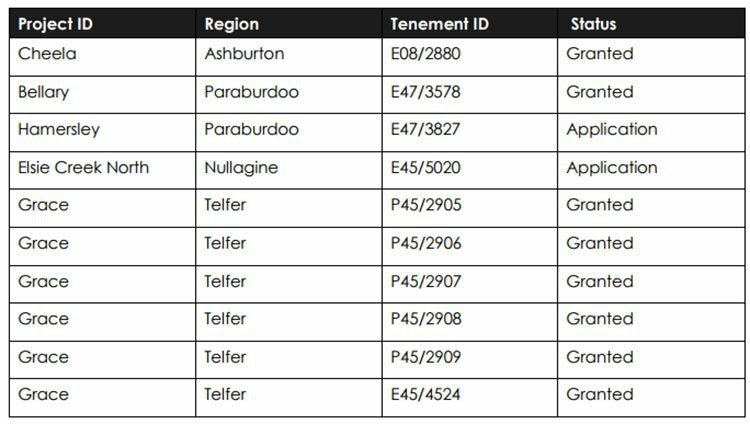 Hardey was a first mover in the Pilbara gold rush, having acquired tenements in November last year — even before the Novo/ARV discovery. The work that Hardey has already undertaken has set EYM up for success, and the chance to follow in the footsteps of Novo and ARV. Back when the Next Small Cap first reported on ARV in February this year, the company had a market cap of just $9 million. 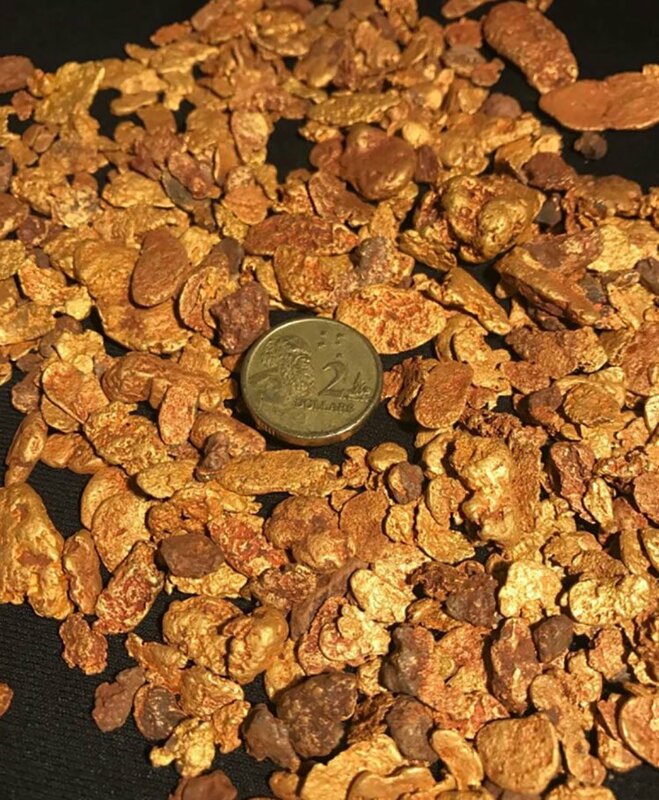 That’s ballooned to a massive $200 million today after the company found in-situ gold nuggets of up to 4cm long in Archean conglomerates at its Pilbara gold JV project. 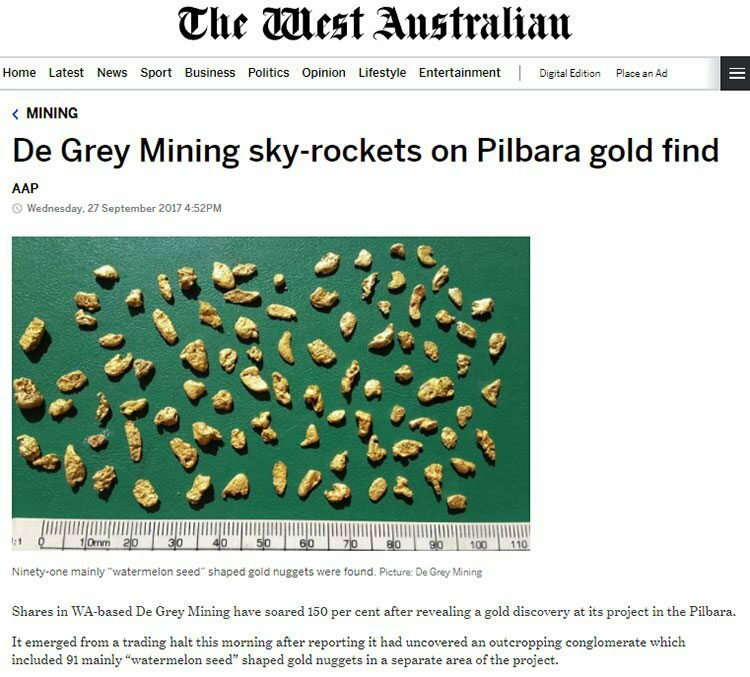 Yet ARV aren’t the only small gold Pilbara gold explorer we’ve written about. Just a month ago, shares in De Grey Mining (ASX:DEG) more than doubled on the day that it announced the discovery of gold nuggets at its Pilbara project. We highlighted the potential on offer from DEG back in April. Kairos Minerals (ASX:KAI) was another explorer that’s seen its shares soar since we last wrote about it and it shifted its focus to Pilbara gold. We have reason to believe that now could be EYM’s turn. EYM’s acquisition elevates it into the Pilbara region as a genuine explorer with a highly prospective conglomerate-hosted gold tenement portfolio, supported by an experienced management team. The seemingly sudden appeal of Pilbara gold kicked off in November last year. At this time Hardey Resources applied for an exploration licence covering 163 square kilometres of ground prospective for Witwatersrand-style conglomerate-hosted gold and high grade orogenic gold in WA’s Paraburdoo region. Since then, a number of ASX listed explorers have identified the Witwatersrand type mineralisation in the region, prompting a rush for land that may host extensions to the orebodies currently being explored. EYM has now entered into a binding agreement with Hardey Resources Pty Ltd to acquire Hardey Resources, along with Hardey’s portfolio of high quality gold and base metals projects in the Pilbara. It has also agreed to proceed with a placement of 166.666,667 EYM shares at an issue price of $0.009 to raise approximately $1.5 million. These projects are the Bellary, Hamersley, Cheela and Elsie North, which cover some 512 square kilometres of Fortescue Group Rocks, as well as the Grace Project situated in the Paterson Province in WA. You can see the Hardey projects on the map below, highlighted in red. On completion of the conditional agreement, EYM will take a 100% ownership interest in Hardey and the Hardey Projects. By way of background, in November last year, Hardey applied for an Exploration Licence covering 163 square kilometres of ground prospective for Witwatersrand-style conglomerate-hosted gold and high grade orogenic gold in WA’s Paraburdoo region. Once EYM’s acquisition of Hardey and its projects is complete, the company will hold a significant tenement package that is said to have similarities to the conglomerates mined in South Africa’s Witwatersrand gold province that has significant gold in Archean sedimentary conglomerates. This is impressive as Witwatersrand is the source of one-third of all gold ever mined. This conglomerate-hosted Witwatersrand style gold mineralisation is often located near surface in the form of gold nuggets, leading to economical and speedy exploration progress, at times only requiring a handheld metal detector. Recently reported Witwatersrand-style mineralisation discoveries in the Pilbara region include those at Novo Resources Ltd’s (TSX-V:NVO) and JV partner Artemis Resources' (ASX:ARV) Purdy’s Reward and Mt OscarWits Gold Project, as well as at De Grey Mining’s (ASX:DEG) discovery at its Loudens Patch prospect. The EYM/Hardey projects are marked in red on the map below. Note the large number of peer gold projects in the immediate locale, and surrounding Bellary and Hamersley in particular. We informed you of ARV’s JV with Canadian-listed Novo in the June article — ‘Hub & Spoke Model Keeps ARV Turning '. The pair commenced exploration immediately and discovered gold in July, sparking each of their share price rallies. With a market cap of C$1.07 billion (A$1.09B), Novo is a major exploration and development company and is involved with some big name mining companies. Its largest shareholder is the $20 billion-capped Newmont Mining Corp (NYSE:NEM). 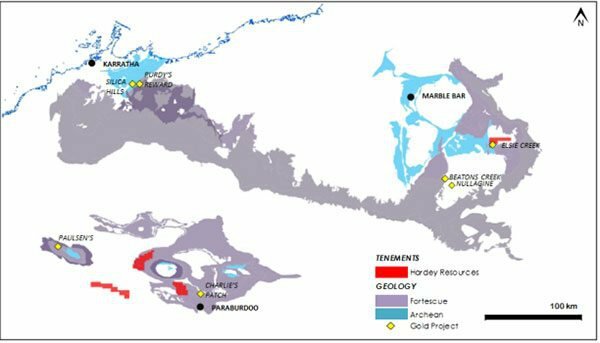 The discoveries by ARV/Novo prompted De Grey Mining (ASX:DEG) to undertake a geological review of its +1.2 million ounce Pilbara Gold Project for conglomerate hosted gold potential of the Witwatersrand style. That resulted in DEG identifying a new conglomerate gold target in late September, which included a significant quantity of gold nuggets found at surface. DEG uncovered 91 mainly ‘watermelon seed’ shaped gold nuggets from 2mm to 10mm in size. This discovery and consequent share price rise, came after a Next Small Cap article in April, in which we highlighted the gold potential of DEG: ‘DEG Hits 1 Million Ounce Gold Milestone: Drilling Imminent '. DEG’s discoveries, combined with that of ARV/Novo attracted significant interest in the Pilbara’s gold potential, leading to a host of companies claiming stakes in the region. Importantly, from an investor’s point of view, the Novo/ARV and DEG discoveries acted as a slingshot for the companies share prices. Canadian-listed Novo is up 780% since early July, while ASX small-caps, ARV and DEG, are up 450% and 480%, respectively. But it’s not just shareholders of the explorers that had major discoveries who are benefitting. Other explorers with tenements in the region such as DGO Gold Ltd (ASX:DGO), Kairos Minerals (ASX:KAI), Kalamazoo Resources (ASX:KZR), and Haoma Mining (ASX:HAO) are in hot demand too. KAI, which has over 1000 sq. kilometres of tenure in the Pilbara that’s highly prospective for conglomerate-hosted gold discoveries, has now attracted the interest Canadian billionaire Eric Sprott (who also chairs Kirkland Lake Gold). We alerted you to KAI back in July in our article on the company... right before it staged a 283% rally over the three months to date. DGO is another junior that attracted attention over the past three months, rising 389%. It is actively exploring for gold across its 2899 sq. 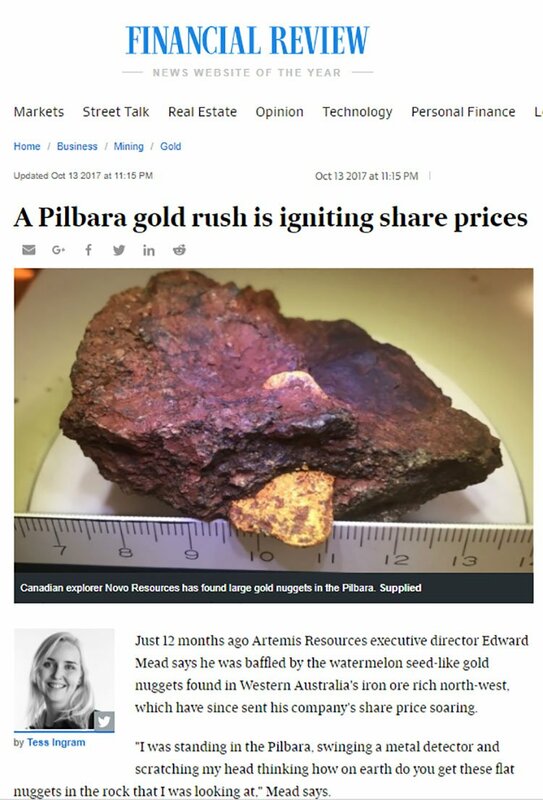 kilometres of Pilbara land holdings and recently discovered at least four kilometres of strike with some conglomerate outcrop as well as two gold nuggets. The past performance of these products is not and should not be taken as an indication of future performance. Caution should be exercised in assessing past performance. These products, like all other financial products, is subject to market forces and unpredictable events that may adversely affect future performance. Like EYM, DGO’s Pilbara tenements are in the region’s activity hub, surrounded by major projects. The question now is whether EYM can reward its shareholders with similar returns, in both the short term and over a longer potential project life. An important thing to keep in mind is that EYM announced its move into Pilbara gold with its acquisition of Hardey and its prospective gold and base metals projects less than a week ago, on October 24. Such is the excitement around the gold prospects of the region, that the company’s share price has already begun its ascent, immediately jumping from 8.5 cents to reach a high of 20 cents, before closing at 14 cents, after trading resumed following the company’s announcement. But there’s still plenty of room to run if the recent performance of its small-cap Pilbara gold peers is anything to go by. Here you can see the EYM’s share price performance over the past three months, compared to that of its Pilbara gold exploring peers — DEG, DGO, KAI, and ARV. As can be seen in the chart above, these junior explorers have had a particularly impressive run over the past six weeks or so. For investors who are still to get in on the gold potential of the Pilbara, but think they’re late to the party, EYM armed with its newly acquired prospective projects could be the answer. An exploration program, involving extensive sampling and prospector-supported exploration, will commence at EYM’s newly acquired projects almost immediately, targeting the Hardey Formation and other prospective conglomerate-hosted gold horizons associated with Fortescue Group Rocks. The initial focus will be the Bellary Project. The Hardey Formation have been mapped extensively throughout the Bellary Project tenements by the Geological Survey of Western Australia and it is widely believed to be the region’s best target. Exploration field crews are currently mobilising to site to begin systematic quad bike assisted soil and stream sediment sampling and prospecting across the Hardey Projects that outcrops within its tenement portfolio. This initial Phase 1 of the exploration program is expected to take 3-4 weeks to complete. This initial exploration will focus on 46 sites of interest that Hardey’s geologist identified. These are located within the target stratigraphy of the Fortescue Group Rocks and are supported by historic geochemistry gold anomalism in some cases. Hardey’s prospectors will work alongside EYM’s geological field team. A lot has happened for EYM since we last updated you on the company on September 28, right after the company kicked off Phase 2 of its drilling programme at the historic Lloyd’s prospect at its flagship Burraga Copper-Gold Project. Having completed phase 1 and 2 drilling at the Lloyds Copper Mine extension, EYM will continue exploration on this copper-lead-zinc polymetallic target in the world-class Lachlan Fold Belt. It also plans to drill at the highly prospective Hackney’s Creek and Isabella gold prospects. As for it Pilbara gold prospects, EYM will now undertake further work to confirm the gold-bearing nature of the prospective conglomerate sequences which have been identified within Hardey’s tenure. This initial phase of the exploration program will take around three to four weeks to complete. Significant results will be reported as they are received, which should make for some attention grabbing newsflow.